Neutron diffraction at the Australian Centre for Neutron Scattering has clarified the absence of magnetic order and classified the superconductivity of a new next-generation of superconductors in a paper published in Europhysics Letters. The iron-based nitride, ThFeAsN, which contains Th2N2 and FeAs2 layers, has been of considerable interest because unconventional superconductivity occurring at a temperature of 30 K. This material was of particular interest as the superconductivity was seen to arise without oxygen doping. A large group of predominantly Chinese researchers, led by Prof Huiqian Luo from the Beijing National Laboratory for Condensed Matter Physics gathered diffraction measurements on the high intensity diffractometer WOMBAT, assisted by instrument scientists Dr Helen Maynard-Casely and Dr Guochu Deng based at the Australian Centre for Neutron Scattering. This enabled them to determine the crystal structure of the compound over a large temperature range. In similar types of materials, the onset of a superconducting state is thought to be associated with magnetic ordering within the crystal structure. 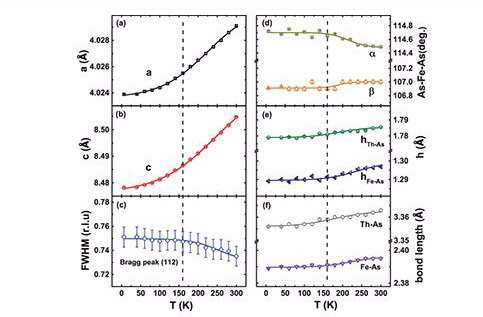 Earlier measurements had shown no magnetic ordering in the ThFeAsN material, and hence this neutron study was an opportunity to confirm this and search for other structural insights into the material's properties. The lack of magnetic order was confirmed because no difference was found between the data sets at 6 K and 40 K. All of the observed reflections could be could be identified as having arisen from the atomic structure from 6K up to 300K – no magnetic reflections were identified. Diffraction patterns over the temperature range from 300 K to 6 K also indicated there was no structural phase transition from tetragonal to orthorhombic in the crystal lattice. The investigators reported that the lattice parameters continuously increased with temperature due to thermal expansion and a weak distortion in the tetrahedron possibly took place at 160 K. Details from the structure point to this distortion coming from the FeAs2 layers. The close relationship between local structure of the FeAs4 tetrahedron and the superconducting temperature, suggested TheFeAsN is in a nearly optimised superconducting state. This is different to many other discovered superconducting materials, which require tweaks in their chemistry to produce the highest critical temperature. The authors also surmised that the close distance of Fe-As would favour electron hopping, reducing electron correlations and orbital order, thereby providing a reasonable explanation for the absence of magnetic order, structural transition and resistivity anomaly. Carrier density measurements indicated that ThFeAsN could already be doped by electrons, which are probably introduced by the N deficiency or O occupancy or the reduced valence of nitrogen. The self-doping effect could be responsible for the superconductivity and suppression of magnetic order.